Directions: Located on Highway 70 in between Alamogordo and Las Cruces. 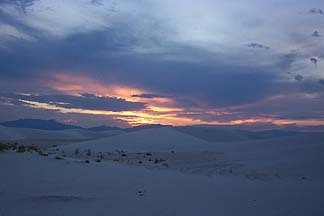 White Sands National Monument is really a breath-taking natural phenomenon. The whole park is located in the Chihuahuan Desert of the Tularosa Basin. The first time I visited there, I had seriously believed the ground was covered with snow! For miles and miles, the sugar-like gypsum piles into sand dunes of various sizes, giving a picturesque Pensacola coast-like impression without the company of ocean. Dotted in the ocean of glistering sands, yucca and other desert vegetation thrive. The park is also frequented by foxes, coyotes, roadrunners, hawks and many small animals. A type of beautiful white lizards can also be found here. Many people find evening time is the best time to enjoy the park. 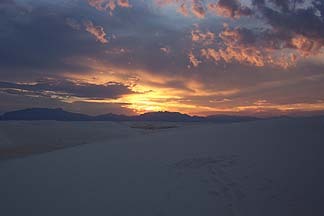 Because of the light dusts and the openness of sky, New Mexico has most beautiful sunsets. 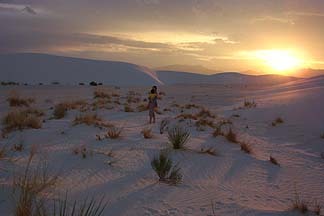 The white sands reflect the brilliant colors of sky, giving the whole area a surreal feel.